Biographies are as different from each other as people. Some are like Vlad the Impaler and some are like Winnie the Pooh. And some are like Vlad the Pooh (he was so nice) and Winnie the Impaler (he was horrible, just ask Eeyore). I’ve been reading Carole Angier’s book on Jean Rhys, and wow, Carole really does want to curl up inside Jean Rhys’ life and stay there for months at a time, the claustrophobic probing and detailed interrogations of the slim novels are frighteningly intense; then there’s Roger Lewis’s biography of Anthony Burgess and Goldman’s book on John Lennon – both authors who obviously HATED their subjects & wished to trash their reputations. 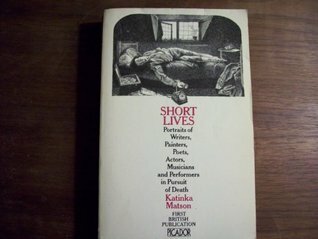 You get the Uriah Heeplike respectful literary biographies and the tell-all sleaze-dealers and the ones which take a life to tell a complex historical story (it can be the best way to read history).Short Lives by Katinka Matson is a great series of mini-biographies of doomed artists. Although I read this years ago it’s still on my shelf in the loft so it never got sent off to Oxfam, and I actually remember it.In no order, these are the best biographies I have read so far.The life of a homeless man with mental health problems in Cambridge, England : Stuart : A Life Backwards by Alexander MastersA mesmerising tragic writer :The Lonely Hunter, a biography of Carson McCullers by Virginia CarrOutrageous tittletattling and gorgeous phrasemaking : Brief Lives by John AubreyThe whole Bloomsbury gay bi whatever thing : Lytton Strachey (the updated version) by Michael HolroydThe whole New York gay bi whatever oh who cares thing The Life and Death of Andy Warhol by Victor BockrisOne of those mighty literary doorstoppers, but a great one : James Joyce by Richard EllmanThe missing part of the Sylvia Plath story : Lover of Unreason by Koren and NegevA frankly unbelievable life – they don’t make ‘em like this any more : The Marquis de Sade by Donald ThomasA side-splitting account of the whole Pre-Raphaelite thing, with wombats : Desperate Romantics by Franny MoyleThe enormous but brilliant Beatles Part One :Tune In by Mark LewisohnIn conclusion, I would like to say, and please don't take this the wrong way - get a life! I remember vividly reading this in 1981 and discussing it with a friend through the only technology available at that time for such things, letters. I don't think emails are much of a substitute for paper and ink. It's like watching a play on TV rather than struggling through the rain, hailing cabs, arriving wet, queuing up, buying the programme, finding your seat, seeing the curtain rise in a hush of expectation, and feeling the atmosphere with fellow humans. This book has short chapters on everyone from Lenny Bruce to Simone Weil, all eaten up in one way and another by their creative talents. This is a good book. It covers the lives of famous people across time including James Dean, Marilyn Monroe, Sylvia Plath...Some of the stories are very enlightening.